This setting book clocks in at 32 pages, 1 page front cover, 1 page back cover, 1 page advertisement, leaving us with 29 pages of content, so let’s take a look, shall we? This review was moved up in my review-queue as a non-prioritized review at the request of my patreons. Old Earth isn’t even a legend anymore, even its location lost to the ravages and vastness of space and time. An undetermined time after humanity spread to the stars, the Archaics rose in their floating, crystalline cities, constructing a hyperspace travel network and engaged in planetary-scaled engineering; theirs was an age where a noble may rule a whole world – but, as Hari Seldon may have noted, all empires must end. The Great Collapse, which may have been as long as 1000 years past, took place, kickstarting a Dark Age of dissolution, where mysterious cultures rose and fell in what once was core human space: The mysterious Zurr, seemingly primitive, yet spread across planets, and the faceless ones, research-sadists, who replaced their faces with incredibly potent sensory apparatuses. When the long night ended, it was the radiant polity that rose, claiming stewardship of paleo-mankind and mastery over hyperspace travel: “We civilize; we do not govern. We end war; we do not wage it. We guard; we do not control. Our thoughts look always to the future.” – This is their creed and it reminded me in a positive manner of Rome’s excellent tripartite album “Die Aesthetik der Herrschaftsfreiheit” on the concept of anarchy as a philosophical world-view, but that as an aside. The default setting of this space opera setting would be the Modern Age ushered in by the polity’s radiant lords. The book classifies the sentient beings as sophonts – biologics contain humans, Star Folk bioships, etc. Moravecs are sentient, self-replicating robots and infosophonts are basically AIs, digital minds and other entities sans physical form that choose to live in the noosphere. As you may have noted, the books makes admirable use of linguistic terms to classify and categorize the campaign setting’s reality. And no, the book never devolves into a garbled mess, though, as often in good fiction, it takes a bit to get into the terminology of the setting. Really cool: Sample artworks explain e.g. clothes worn, weaponry, etc. in a concise manner that manages to squeeze a surprising amount of information on each page – a picture of a space captain, the afro-wearing, badass lady Stella Starlight, for example, feature sidebars on salvage and the lost ancient starships. The book also showcases the hyperspace gates and their connections between regions of space – which would be as well a place as any other to note how this pdf is laid out, for the layout is brilliant: The artworks and bits of information are depicted in a manner not unlike the Star Trek/Star Wars almanacs – artwork, explanations, trivia, graphics – the similarity even extends to the advertisement mentioned before, which included an “action figure” in the artwork. Anyways, we continue from the big picture to the more detailed observations of the regions of hyperspace – from the Outer Rim, where the vaguely feline Djägga live and places of interest include Fortuna IV, a gambler’s planet, Gogmagog, the planet of giant robot battles (!!) and Boreas, an ice-covered moon, where boreal sea life was weaponized, including bacteria that reanimate the dead. Yes, amazing. There also would be the Alliance (think of a smaller Federation), the Instrumentality of Aom, a theocracy founded on cold practicality (with Illuminatus!-easter-egg-nod), the Coreward Reach…have I mentioned phantasists selling mass-produced neural dreams and oneiric experiences? There is also the Vokun Empire, once fearsome conquerors in decline, who even have a slave-race of humanoid computers….and we even take a look at a cantina (Star Wars association obviously intended), with several NPCs noted, each of which featuring his/her/their own angle for adventuring. Nomadic clades (the name for race employed herein) sans homeworld are also covered and so are pirates and other criminals – the sample artwork for the latter looking like a cross between a yeti and a tarsier. A list of most wanted, notes on the pharesmid syndicate – there is a ton of adventuring potential here. Where there are species and more or less peaceful societies, there are bound to be those outside – hostile species generally considered to be bad news. These include the Kssa, oviparous humanoids with reptilian characteristics, ruled by the Cold Eggs, the Ssraad (coincidentally somewhat similar to the classic, closed IP Slaadi) and we also talk a bit about psi and psionics and their roles in the galaxy. The book also sports notes on terminology, a pronunciation guideline and concludes with 5 basic operation guidelines, each of which coming in 8 variations – these are one-sentence hooks to develop. Editing and formatting are top-notch, I noticed no glitches. The layout by Lester B. Portlyis FANTASTIC: With the extremely high full-color artwork density (there is an original piece on almost EVERY page) and the cool structures reminiscent of classic scifi almanacs, the pdf is a beauty to behold. The pdf sports no bookmarks, which constitutes a serious comfort detriment – if you can afford it, I’d strongly suggest getting the PoD-version. The book is worth it, production value-wise. Trey Causey’s Strange Stars is frankly inspiring in the best of ways. When I saw the page-count for the book, I did not expect much, particularly considering the density of artwork herein. It is BAFFLING how much flavor and information the author managed to cram into the pages – there are a ton of inspiring tidbits herein, enough to inspire campaigns galore. While I really wished this book was a really huge campaign setting, I have seen a ton of books with 3 or 4 times the pagecount deliver less – this is a great supplement if you’re looking for some inspiring nomenclature, ideas, etc. 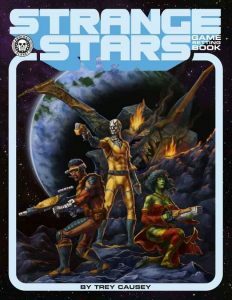 As an aside: The astute reader may have noticed some serious potential for crossover regarding the history of Strange Stars and Starfinder – the ideas contained herein can be added to Starfinder pretty easily…and yes, the same holds obviously true for Traveller, Stars Without Number, etc. How to rate this, then? Well, the lack of bookmarks for the electronic version costs that version a half a star (4.5 stars, rounded down), but the print-version I’d consider to be 5 stars + seal of approval. As mentioned, I’d suggest getting the PoD-version. You can get this cool, system-neutral book here on OBS!